Implemented in 1996, the Information Technology Agreement (ITA) has played a pivotal role in facilitating global trade in information and communications technology (ICT) products. Under the ITA, 82 signatory countries have agreed to fully eliminate tariffs on hundreds of ICT products. By reducing their costs, the ITA leads to increased use of ICT goods, which spurs productivity and economic growth in signatory nations, while deepening their enterprises’ participation in global value chains for the production of ICT goods and services. Recognizing these benefits, 53 nations agreed in December 2015 to reduce tariffs on an additional 201 ICT tariff lines (including hundreds of products, parts, and components) as part of an expanded list of goods covered by the ITA. Yet, despite its proven benefits, some developing countries have remained on the sidelines of the initial ITA and its recent expansion. In this report, ITIF analyzes the effects of six developing nations—Argentina, Cambodia, Chile, Kenya, Pakistan, and South Africa—joining the original ITA as well as its recent expansion. It finds that doing so will boost economic growth for each of these countries, while generating tax revenues from new economic growth in the 10th year following accession that more than offset tariff losses for two of the six nations, while recovering most tariff losses for another three. Participation in the ITA provides an opportunity for developing countries to reduce tariffs, thereby lowering the prices for, and expanding consumption of, productivity-enhancing ICTs, while deepening countries’ participation in global value chains for the production of ICT goods and services. Moreover, joining the ITA can engender faster economic growth and higher living standards because it gives domestic businesses and households access to more affordable and higher-quality ICTs, which are the modern economy’s chief drivers of productivity, innovation, and economic growth. This report finds that joining the ITA would boost economic growth for Argentina, Cambodia, Chile, Kenya, Pakistan, and South Africa, with some growth evident even in the first year post-accession, but much more over a 10-year period. Despite the concerns some have raised regarding lost tariff revenues resulting from ITA accession, the report finds that in the 10th year after ITA accession, two of the countries—Argentina and Kenya—would generate revenues from taxes in excess of tariffs forgone, while South Africa would come close and Chile and Pakistan would recover two-thirds to three-quarters of tariff revenue forgone. The table below summarizes key findings regarding the economic growth impact and tax revenue effects of these six nations joining the ITA. Bottom line, the growth and development benefits of joining the ITA over time far outweigh the short-term loss in tariff revenues that may occur. ICTs are one of the most important drivers of economic growth in developing countries, and joining the ITA has a palpable impact on spurring the adoption and consumption of productivity-enhancing ICTs across all sectors of an economy. Already in the first year post-ITA accession, joining the ITA would generate positive economic growth for all countries studied. Over a 10-year period, joining the ITA would bolster Argentina’s economic growth by an estimated 1.52 percent; Pakistan’s by 1.30 percent; Kenya’s by 1.29 percent; and Cambodia’s by 0.98 percent. Chile and South Africa would realize positive economic impacts, but lower than for the other four countries. 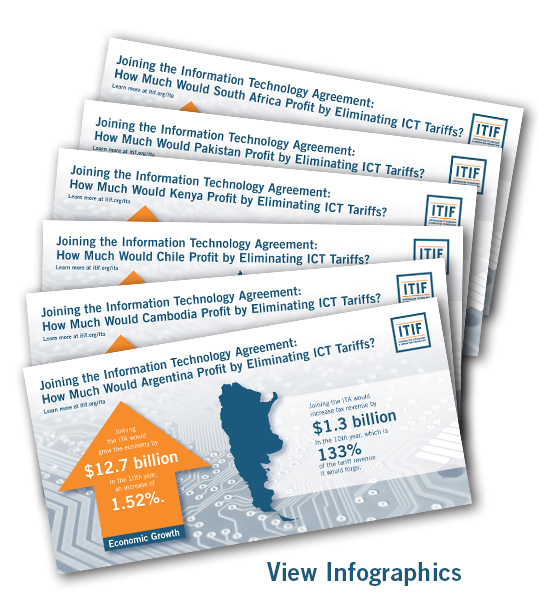 This is because these countries already have relatively low tariff rates on ITA-covered ICT products, due chiefly to their participation in free trade agreements (FTAs) with their largest trade partners in ICT goods, such as Chile’s FTA with the United States. In the 10th year post-ITA accession, new tax revenues would allow Argentina to recover 133 percent of forgone tariff revenues it would have received in that 10th year, while Kenya would recover 109 percent, South Africa 92 percent, Pakistan 75 percent, and Chile 67 percent. Cambodia would only recover 23 percent of forgone tariff revenues in year 10 (due in large part to its reliance on non-consumption taxes). When considered on a cumulative basis—that is, assessing the tariff revenues forgone versus the new tax revenues gained in each individual year and then summing them up—of the six study countries, only Argentina would fully overcome the gap between tariff revenues forgone and tax revenues collected over the full 10-year period, collecting an additional 6 percent above cumulative tariff revenues forgone. In total, Kenya would recover 83 percent of tariffs forgone during this period. However, the impact ITA accession would generate on a country’s income profile in the 10th year post-ITA accession is much more indicative of the positive and enduring long-term impacts ITA accession can have on countries’ financesITA accession makes countries more attractive locations for ICT goods and services producers and exporters. ITA membership sends a strong signal that these countries are open for trade and investment and can be used as a base of operations for global supply chains. ITA accession can bolster employment through a number of channels, including the following: 1) by making the country a more attractive location for ICT goods production; 2) by expanding a country’s participation in specific tasks within global value chains for ICT production (e.g., testing ICT products or conducting final packaging or assembly; 3) by enabling countries’ ICT services industries (e.g., mobile applications development or business-process outsourcing) to grow by helping make them more competitive and innovative; 4) by making a countries’ goods exporters—whether they produce ICT components or end products, or leverage ICT components as inputs to produce other manufactured goods, such as automobiles or household appliances—more globally competitive; and 5) even just by reducing the costs enterprises have to pay for ICT goods, meaning they can invest more resources in hiring workers to more productively grow their own businesses. ITA accession matters not just to companies in a country’s ICT goods- and services- producing sectors, but to all enterprises and industries that leverage ICTs and use them to digitalize their businesses and operations.